Louise loves art. She loves to draw pictures and hang them all over the house. Louise does not have time for her little brother, Art. He loves art too. He takes one of her masterpieces and cuts it up into a chain of paper dolls. Louise is angry until she sees how good it really is. She hangs it on the ‘Gallery du Fridge’ alongside her own artwork and gives it a blue ribbon. Louise really does love Art after all! Kelly Light has shown a new light on siblings. The witty play on words is simple enough for the youngest readers to understand. And the relationship between Louise and Art is genuine and adorable. Art steals Louise’s heart with his paper dolls. Look carefully at the pattern… Louise, Art, Louise, Art, Louise, Art. What a beautiful tribute to siblings! Louise loves Art. Art loves Louise. And I love Kelly Light’s new book! I haven’t read this book yet, but seen it reviewed. Such a smart and creative book for kids. Yes, it is Pat. Hope you get a chance to ‘love’ it soon! Yes, you definitely need your own copy! I’ve been following the pre-publication buzz and couldn’t wait to read it! Juliana, I love EVERYthing about this book: the artwork, the characters, the wonderful message and certainly its encouragement for creativity. Kelly is SO talented and just as nice as she is talented 🙂 Great review! I agree! 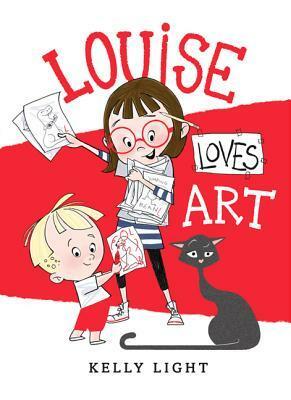 I’ve never had the pleasure of meeting her, but how could she not be nice… after all she created Louise and Art!